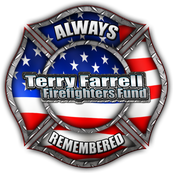 Please help the Terry Farrell Firefighters Fund secure a Response Vehicle so they can make deliveries of equipment to FD's in need. Every bit helps! The 9-11 Patch Project has been helping the world remember the Heroes of 9/11 since Dec. of 2001. We have also raised funds to benefit other 9-11 related Charities. FDNY's Local 854 supports the 9/11 Patch Project! Click HERE to read more about the support of the U.F.O.A. These are the Iconic photos from Thomas E. Franklin. Each 11" X 14" photo is, matted on an American Flag, individually signed and numbered. Only 911 of these were numbered and hand signed by Thomas E. Franklin. Get one for you home, station or office by clicking the image to the left. Since December of 2001, over 10,000 organizations around the world have made one of the 9-11 Uniform Patches their promise to NEVER FORGET. Has your dept. added one of the the 9-11 Patches to your uniforms or other clothing? Click the graphic to the left to get all the details. You will also be able to order the patches from this page. The FDNY Firehouse Sponsorship program was initiated over a year ago so that all FDNY Firefighters could receive at least one of the Original 9-11 Patches for free. To date, over 75 firehouses have been sponsored! A $100 donation names you or your organization as the sponsor and sends each member of that firehouse a 9-11 Patch. Click the graphic to the left to see who has sponsored and to become the next sponsor. Hello, my name is Brett Hill and I am the founder of the 9/11 Patch Project. I have run this project since December 15th of 2001. I am a former Firefighter/Paramedic of 20 years (Southern California) and currently work as a Fire Inspector for NBCUniversal in Hollywood, at the famous Fire Station 51. More about the project HERE. Learn where the net proceeds from the sale of merchandise go HERE.